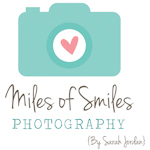 Miles of Smiles Photography is a full time, fine-art portrait business located in Austin, Texas. Photographer Sarah Jordan specializes in customized design, and turning her clients' sweetest memories into forever ART for their homes. Our fully equipped Studio is located just five minutes south of downtown Austin, and we offer our clients a full line of beautiful heirloom products. Scheduling: Our calendar fills early (usually 4-5 months in advance and about 6 months in advance for Fall sessions), so scheduling early is key. Contact Us for availability and to learn how we can create something magical for your family and home. Sarah is a newborn art and posing specialist and has a beautiful Newborn Posing Flow that helps her get safe and gorgeous images for you to cherish and look back on. There is no substitute for experience and education when selecting a photographer for your tiny new baby. We specialize in Maternity, Newborn, Baby's 1st Year, and Family photography. We also offer a popular Baby's 1st Year Plan to capture that magical first year in a baby and family's life together. UNICORN MINI-SESSIONS are coming! May 19th. Click here. Be the first to know about mini-session deals, Unicorn sessions, Santa sessions, & more!